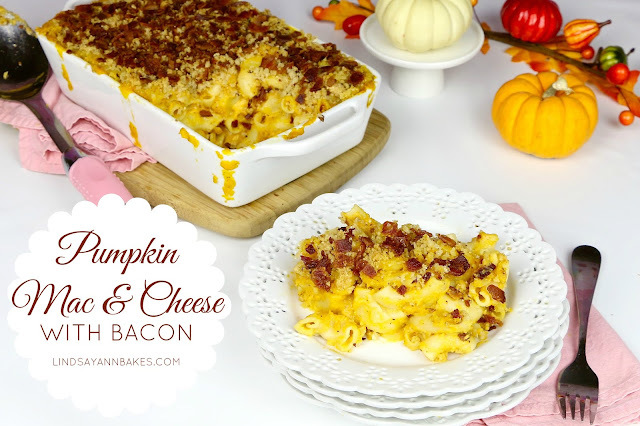 Everyone’s favorite comfort food, with a fall twist... 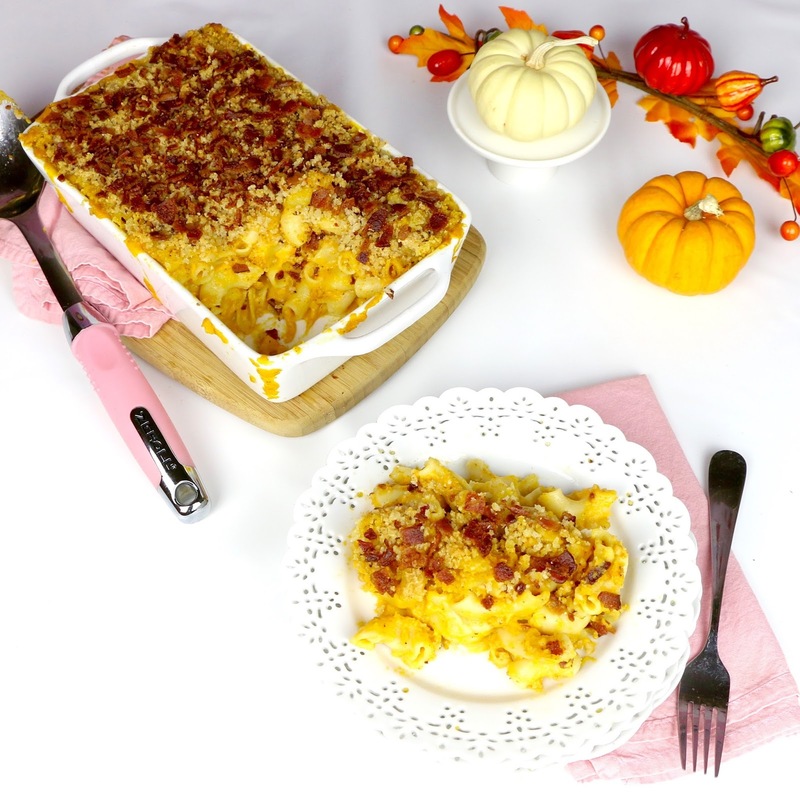 Introducing, Pumpkin Mac & Cheese with a Crispy Bacon Parmesan Breadcrumb Topping! This is the newest addition to my Thanksgiving table and I hope it becomes yours too! This creamy cheesey sauce is silky and rich with a hint of those fall flavors from the pumpkin and a little nutmeg. 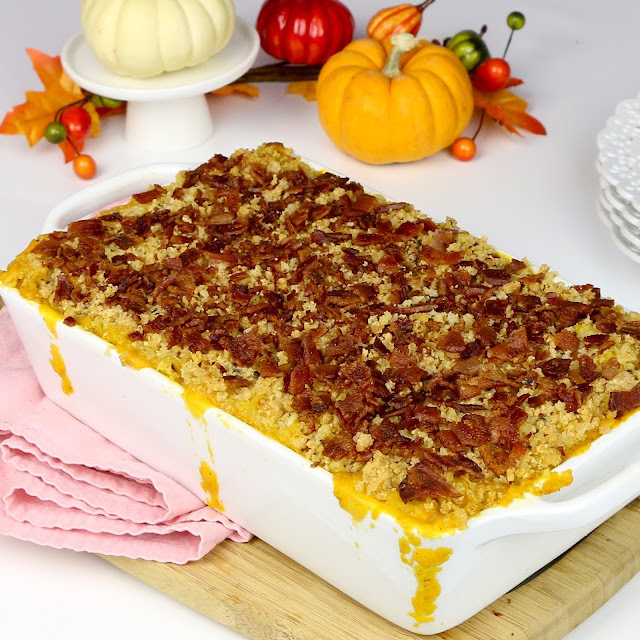 It’s baked off with a crunchy parmasan breadcrumb topping studded with crispy bacon, to really take it up a notch. 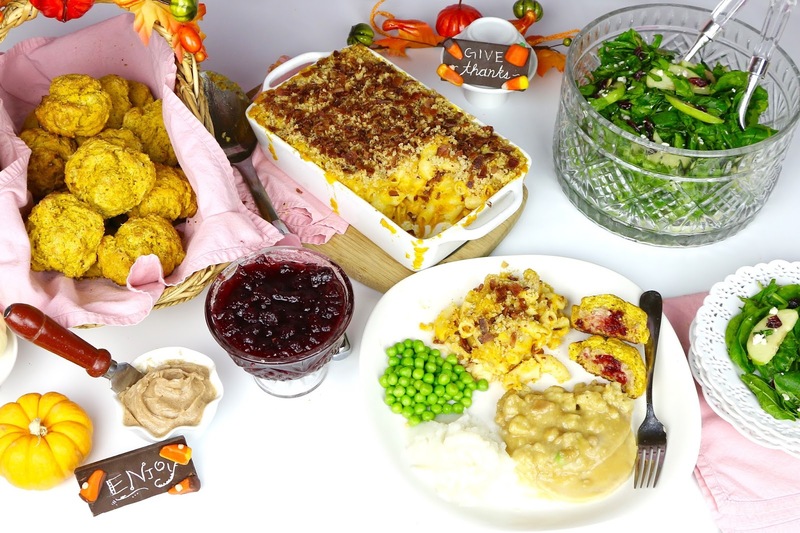 This is such a great addition to Thanksgiving dinner, or goes perfect with my pumpkin biscuits and fall spinach salad for a really festive Autumn meal. 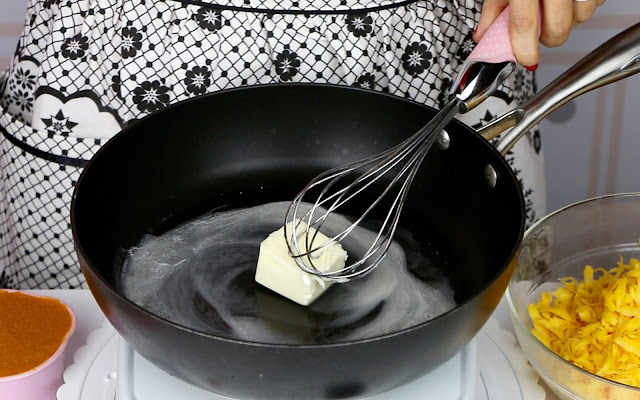 So to make the sauce, melt half a stick, which is ¼ cup, of unsalted butter over medium-low heat. 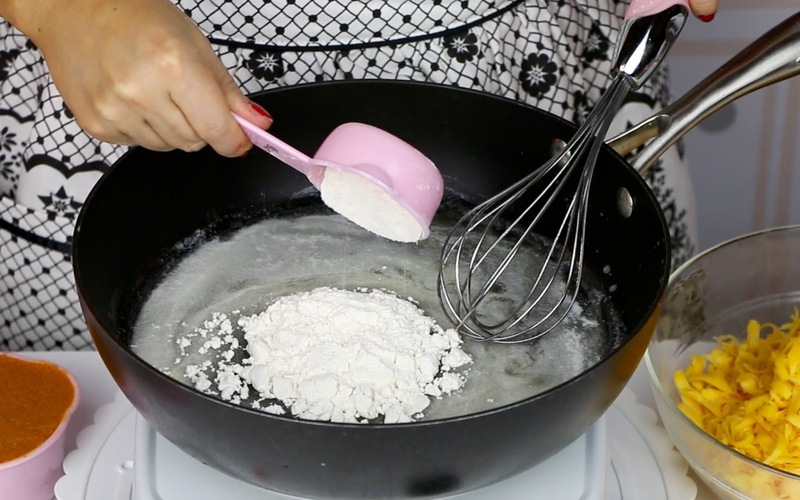 Then , add ¼ cup of all-purpose flour, and cook this for about 1 minute, whisking constantly to remove any lumps. This is the roux that is going to thicken up the cheese sauce. 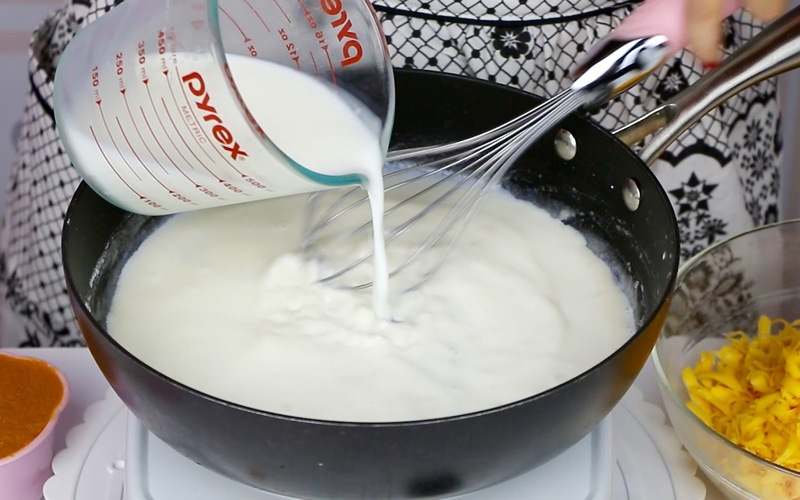 Now, Whisk in 2 cups of half and half, or you could use milk if you like, and cook this for about 5 minutes, making sure you keep whisking it, until the mixture starts to bubble and thicken. We just want to cook it just long enough to cook off the starchy raw flour taste, but we’re not going to let it brown, because that’s when it starts to lose that thickening power to give us that thick luxurious sauce. 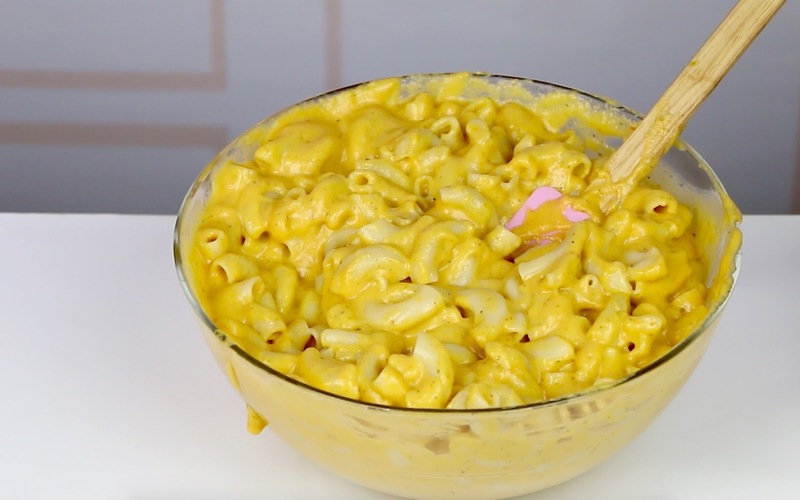 And you’ll know the sauce is ready when you coat the back of a wooden spoon and you can leave a line with your finger, without the sauce running back in. And it wouldn’t be mac and cheese without the cheese, so we’re going to turn off the heat and stir in our cheese until it’s all melted in there! 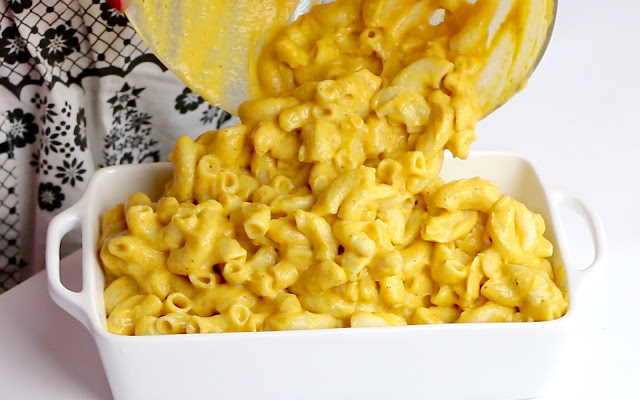 I always grate my own cheese instead of using the pre shredded kind because it just melts down so much nicer and creamier. ...and give it a good stir to get it all coated. 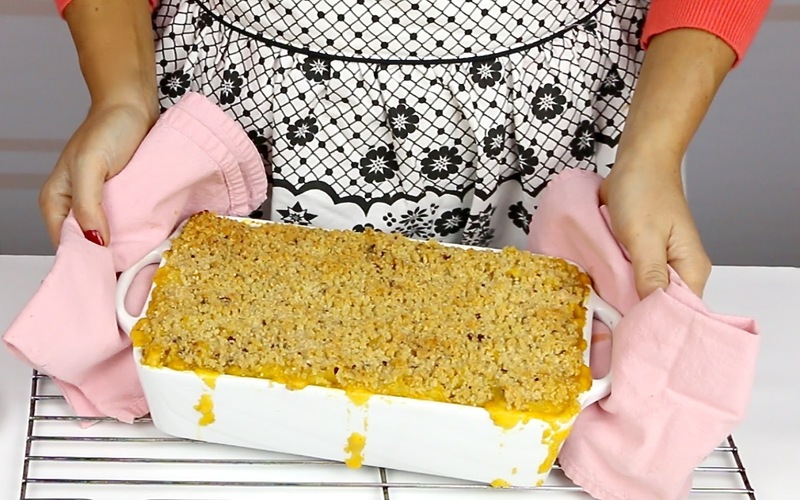 Now you can really go ahead and serve it just like this, but I like to take it one step further and add a crunchy topping and bake it all up so it’s nice and bubbly with that crispy golden brown top. Turn off heat and stir in the panko bread crumbs and grated Parmesan cheese... because mac and cheese can never have too many layers of cheese, and sprinkle this evenly over the mac and cheese. 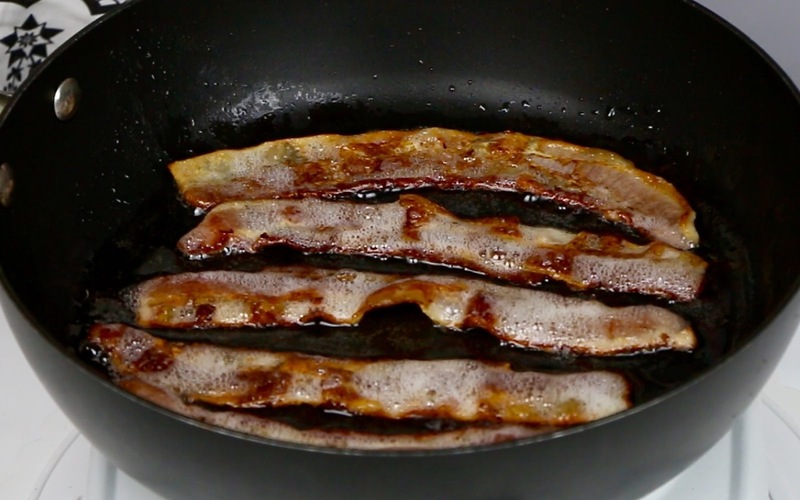 If you skip the bacon, just replace the bacon grease in the pan with 1-2 tablespoons of melted butter or oil. Bake, uncovered, until it’s nice and bubbly and the top is golden and crispy. 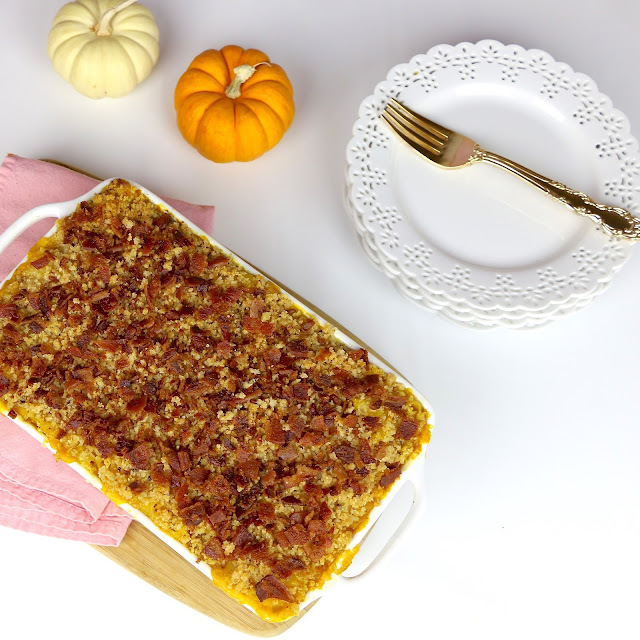 For the finishing touch, just crumble that bacon we set aside, right on top. 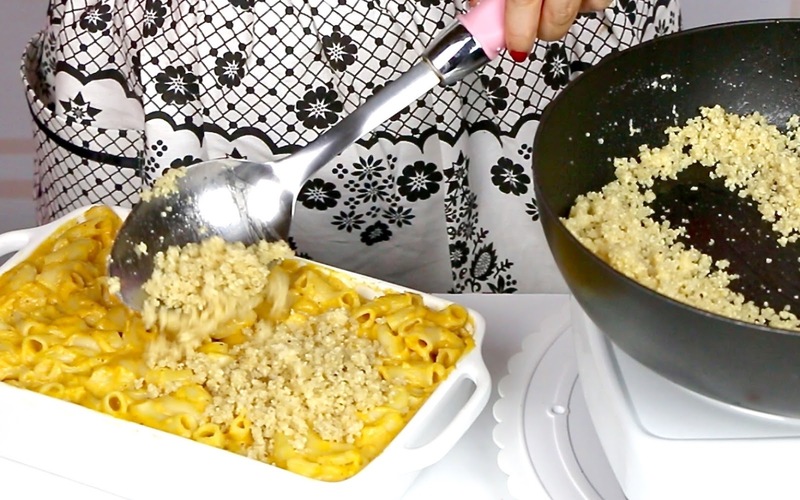 Let this set up for about 10 minutes before serving. Heat oven to 350°F. Add pasta to a large pot of boiling, salted water (about 1T salt), and cook the pasta until al dente according to package directions; drain and set aside. 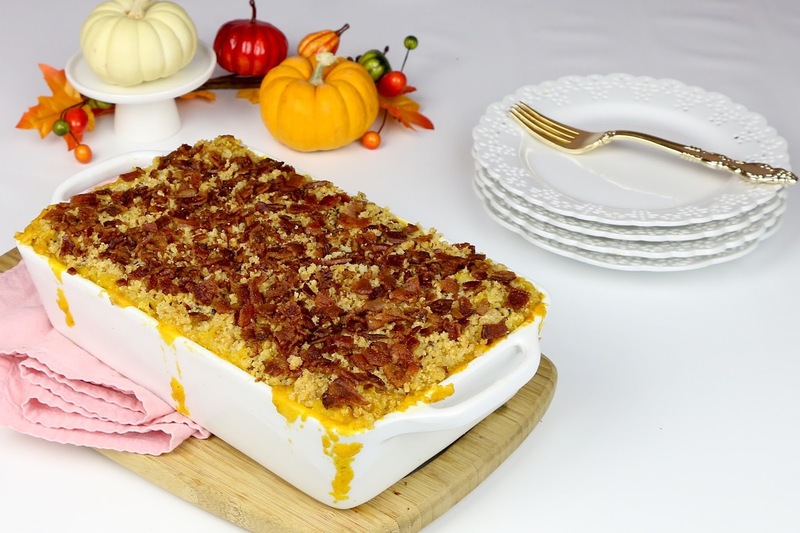 Spray a 2-quart casserole dish with non-stick spray. 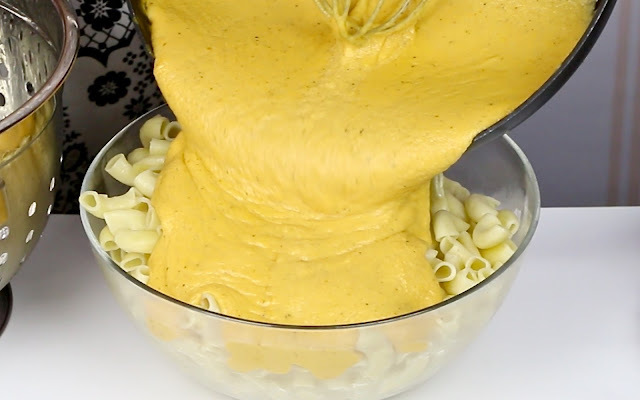 To make the sauce, melt butter over medium-low heat. Add flour, and cook for 1 minute, whisking constantly to remove any lumps. 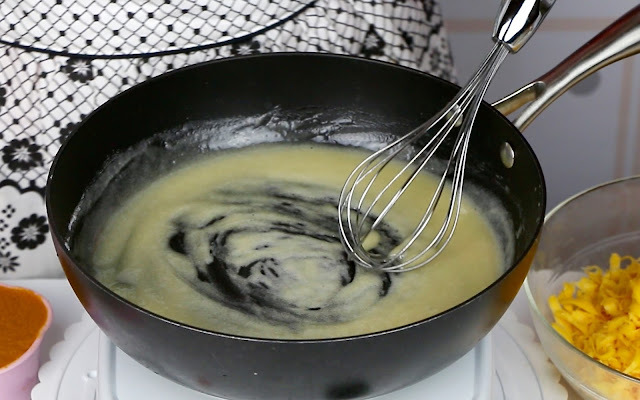 Whisk in half and half, and cook for about 5-10 minutes, stirring frequently, until mixture starts to bubble and thicken. 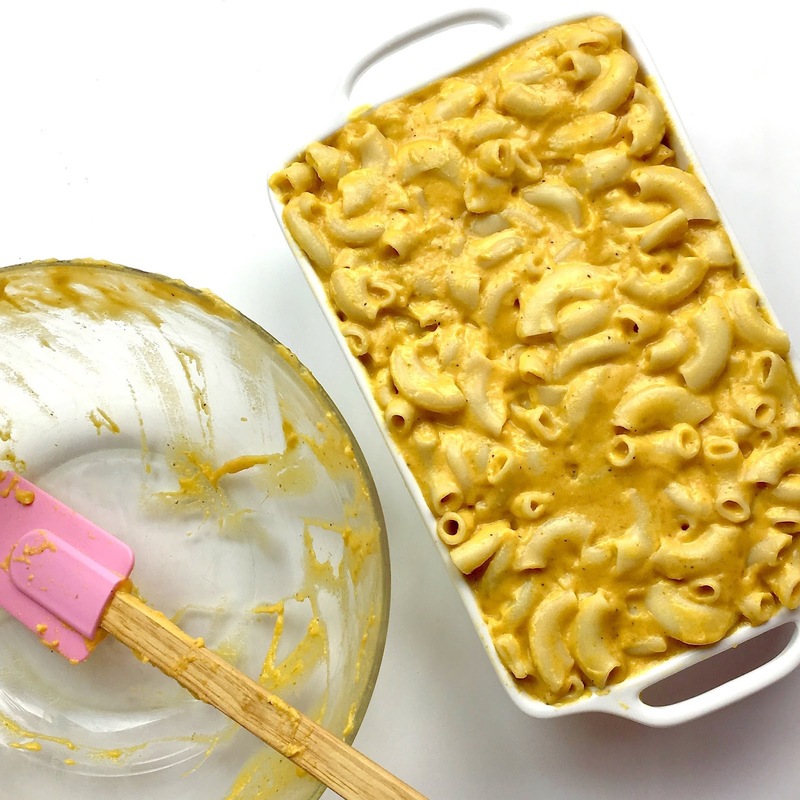 You will know the sauce is ready when the back of a wooden spoon is coated and you can leave a line with your finger without the sauce running. Season with salt, pepper, onion powder, garlic powder, and nutmeg. 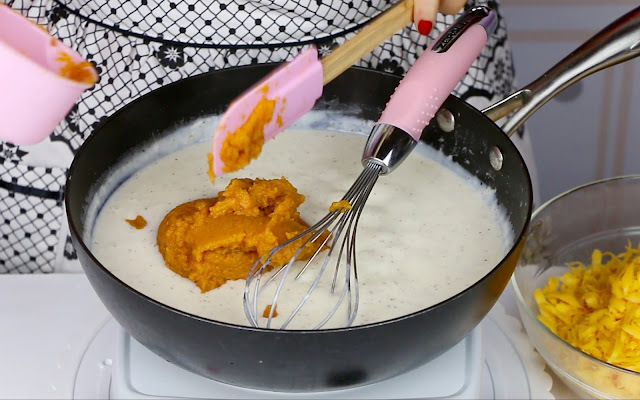 Whisk in pumpkin. 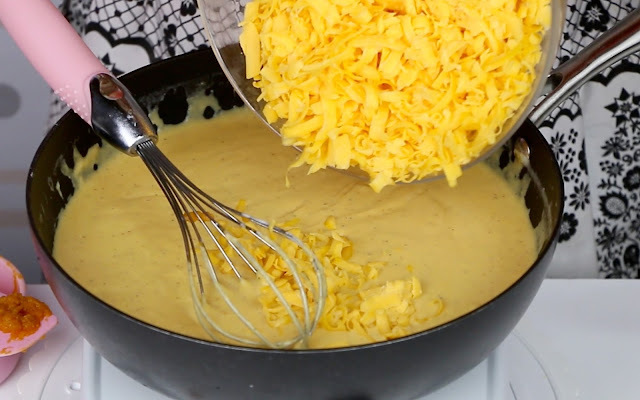 Turn off heat and stir in cheese until melted. Add sauce to pasta and stir to coat. Pour into greased 2-quart casserole dish. For the topping, cook bacon in a skillet over medium heat. Remove from pan and drain on a paper towel lined plate. 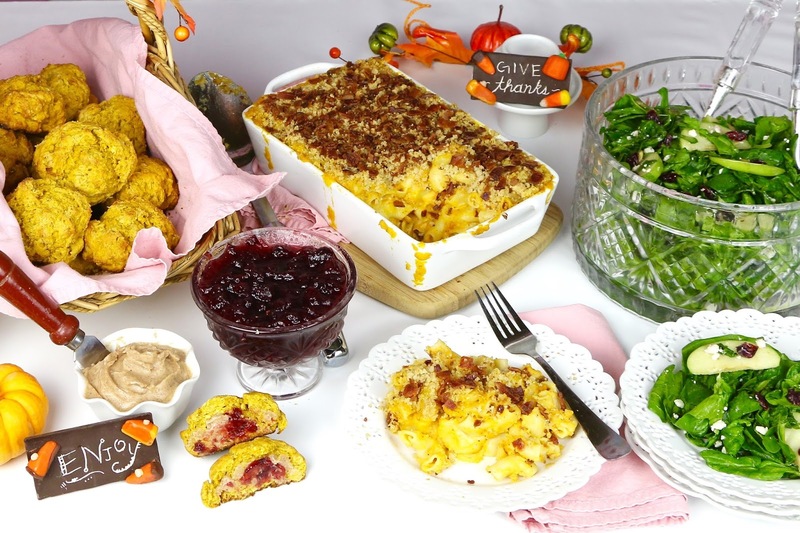 Turn off heat and stir in breadcrumbs and Parmesan cheese. Sprinkle topping evenly over the mac and cheese. 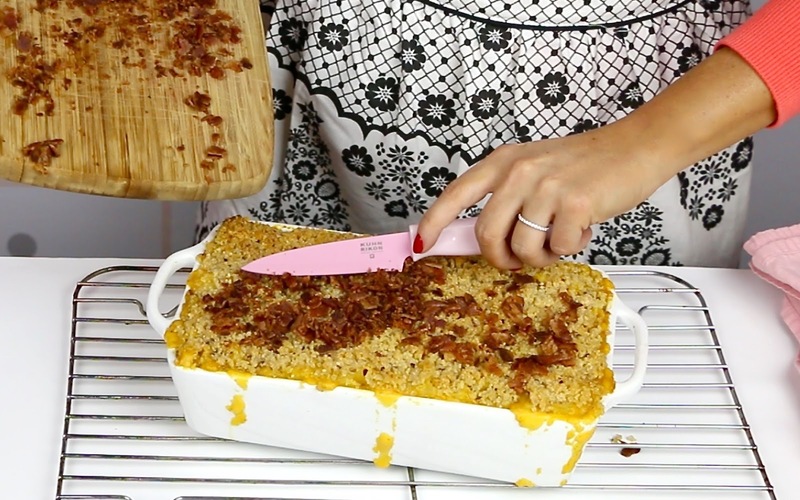 Bake, uncovered, for 20-30 minutes or until bubbly and top is golden. Crumble bacon on top. 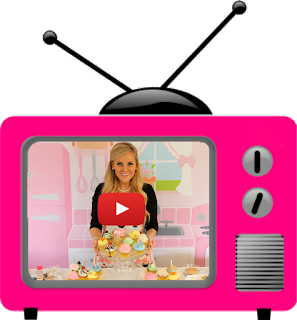 Let stand 10 minutes before serving.